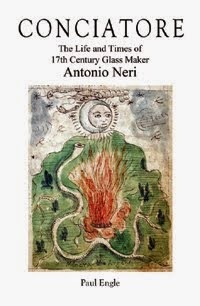 The story of 17th century glassmaker Antonio Neri weaves together closely with that of a Medici prince also named Antonio. The prince was six months younger, living quite a different life, yet holding many of the same interests. Don Antonio de' Medici was the eldest and only surviving son of the second grand duke of Tuscany. He became both Neri's employer and his benefactor. Don Antonio's own fascination with nature's secrets ran in his blood, a fascination that preceded him by at least four generations. His father Francesco and his grandfather Cosimo, both grand dukes of Tuscany, avidly pursued the vagaries of natural secrets. Cosimo had picked up the interest of alchemy from the notebooks of his own paternal grandmother, Caterina Sforza, as preserved by his father, Giovanni dalle Bande Nere. Don Antonio would carry on the family passion working in the laboratory built by his father on the north side of Florence, called the Casino di San Marco. Shortly after the prince settled in, priest Antonio Neri came to work in the Casino laboratory and there learned the craft of glass formulation.